We offer our clients 63mm Single outlet Landing Valve as per IS: 5290 Type A specifications. These ISI marked hydrant valves are available in 75mm NB inlet & 63mm female inst. outlet. These are manufactured by using Gunmetal of IS 318 LTB2 / SS304 / SS316 specifications. Its inlet can be provided in flanged type as per our client’s requirement. The outlet is generally female instantaneous and male inst. outlet is available on request. 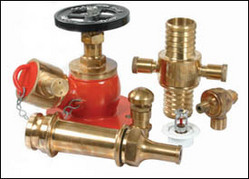 Our hydrant valves are available in size range of 38mm to 63mm.